The mission of the UMDNJ PA Program is to prepare primary care physician assistants who will provide health care under the supervision of a physician in a variety of settings in order to meet the needs of the community. The mission of the Methodist University Physician Assistant Program is to establish an environment in which qualified students, recruited nationally, can develop a strong foundation in treating their patients with clinical competence, compassion and respect, while developing both personal and professional integrity. This program is the first of its kind offered in the Quad Cities and Western Illinois region. At St. Ambrose, we’ve dedicated ourselves to becoming leaders in training health care professionals and can prepare you for a growing profession that offers excellent career opportunities. Our small class sizes offer you the chance to form tight relationships with your classmates, and our faculty members will be by your side to support you throughout your time here. The program strives to achieve its mission in all aspects of its operations, including student selection, didactic and clinical curriculum, and graduate outcomes. The faculty and students engage in teaching and learning, community outreach, and advocacy that focus on improving the health status of California’s citizens, particularly those in medically underserved areas. The mission of the Northwestern University Feinberg School of Medicine Physician Assistant (PA) Program is to prepare PAs to provide compassionate, high quality, patient-centered care as members of interdisciplinary teams. The graduates will be culturally competent, committed to continuous learning and professional development, and make significant contributions to communities and the advancement of the PA profession. Eastern Virginia Medical School Norfolk, VA 12 months 2 to 4 Students Physician Assistant Fellowship in Emergency Medicine Overview The EVMS School of Health Professions and Emergency Physicians of Tidewater (EPT) have collaborated to sponsor a Physician Assistant (PA) Fellowship Program in Emergency Medicine. This unique program builds upon the strength of our highly successful and fully accredited PA program, combined with one of the largest and most effective emergency medicine physician practices in Virginia. Fellows accepted into the program will simultaneously be full-time EVMS students and employees of EPT. Graduates of this one-year Fellowship Program will possess substantial skills, knowledge and competencies required in the field of emergency medicine. The PA profession continues to be ranked among the fastest growing career opportunities, and EPT continues to be the state’s single largest employers of physician assistants. Mission To educate and train highly motivated physician assistants in the challenging and diverse knowledge base and procedurals skills required for excellence in clinical practice in emergency medicine. For additional information, please contact Oliver Agustin, PA-C. The Master of Physician Assistant Studies Program is committed to the education of highly qualified compassionate Physician Assistants who are part of the health care team and are responsive to the developing health needs of their communities as culturally competent clinicians, educators, facilitators, and leaders. 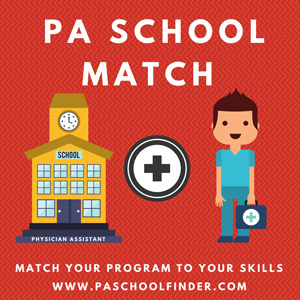 The goal of the PA Program is to develop graduates who are competent, caring physician assistants possessing the skills of life-long learning needed to incorporate new knowledge and methods into their practices and to adapt to a changing medical environment. The mission of the Saint Louis University PA Program is to educate men and women to become competent, compassionate physician assistants dedicated to excellence in health care and the service of humanity. To that end, our knowledgeable and dedicated faculty and staff create an educational environment that promotes an understanding of human needs and ethical issues as well as the acquisition and application of patient-oriented clinical knowledge and skills. Learning to provide competent, compassionate and comprehensive health care. The mission of Salus University is to protect and enhance health and well-being through education, research, patient care and community services worldwide. Howard University Physician Assistant Program has been in existence since 1974. Howard University Physician Assistant (PA) Department has served as an integral component in the PA educational arena by its unique position of being based at a Historically Black University.